Proposed BAM theater on Ashland Place. Image: H3 Hardy Collaboration Architecture. BAM to restore former Salvation Army building’s facade and construct six-story rear addition. 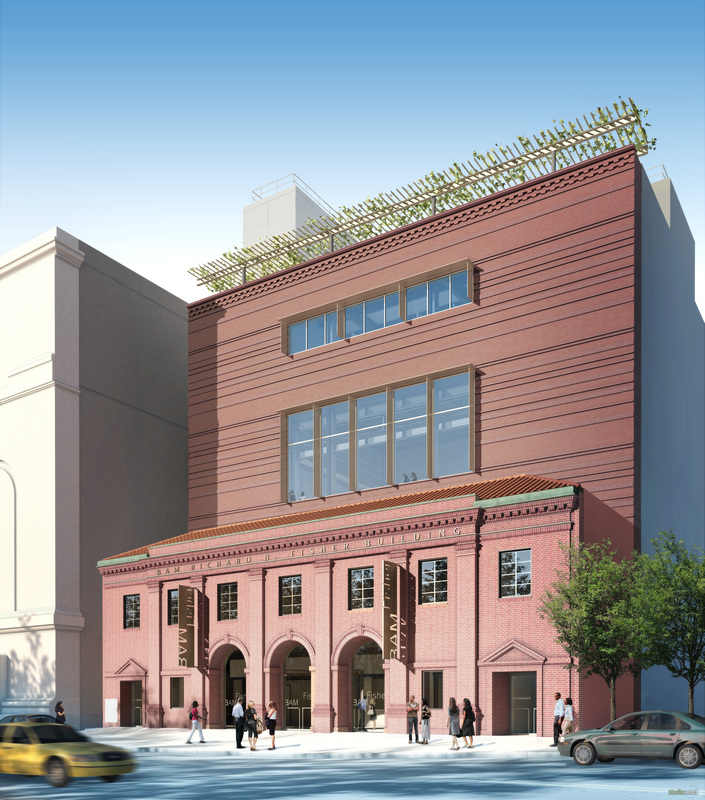 On June 16, 2009, Landmarks approved the Brooklyn Academy of Music’s proposal to build a new theater by renovating and expanding a two-story building at 321 Ashland Place within the Brooklyn Academy of Music Historic District. The site, occupied by the classically-inspired red brick building built by the Salvation Army in 1927, lies between BAM’s Howard Gilman Opera House and the individually- landmarked Williamsburgh Savings Bank. The plan would restore and alter the facade, demolish the building’s rear extension, and construct a six-story building containing a 255-seat theater in its place. At the hearing, BAM President Karen Brooks Hopkins testified that the academy was the oldest performing arts center in the City, and that the proposed project, along with other renovations in the past decade, would ensure that its mission continued into the 21st century. Hopkins stated that the new building would provide “an intimate performance space” unlike any other BAM facility, and added that BAM would partially devote the space to community and education programs. The project’s architect, Hugh Hardy of H3 Collaboration Architecture, noted that the neighboring opera house and the bank building are much larger in scale than the existing two-story structure, but that the new rear building would reach the level of the opera house’s roof and the top of the bank’s dais. Hardy stated that they initially considered several designs for the new structure, some quite avant-garde, but ultimately decided that “Brooklyn is bricks.” The rear structure will include a dark, brick facade to differentiate it from the lighter brick of the Salvation Army building and provide two horizontal rows of windows. Hardy said that the facade’s shape will also echo the big, flat surfaces of the adjacent buildings. The non-historic infill of the Salvation Army building’s three arches will be removed and replaced with glass, and the center arch will serve as the building’s main entrance. This will be flush with a new sidewalk, obviating the need for a handicap-accessible ramp. Commissioner Pablo Vengoechea stated that he found the “boxy quality” of the proposed structure appropriate for its use as a theater, and suggested working to make the sidewalk more “plaza-like.” Commissioner Diana Chapin praised the project as simple, modest, and elegant. Landmarks unanimously approved the proposal, with the proviso that the applicants work with its staff to address unresolved issues over design details. LPC: 321 Ashland Place, Brooklyn (COFA# 09-1475) (June 16, 2009).